After the success of their appearance on the cruise ship they packed their bags and set off for South America, via Italy, where they were to pick up another cruise ship to cross the Atlantic. After a few weeks of work in Italy, they discovered that their croupier manager (one had dropped out of the picture) was not quite what he said he was and they were forced to stay in Italy and find a new manager to provide them with an income and enough money to return to the UK and safety. During one of their appearances at a restaurant in Forte dei Marmi, La Cappannina de Francesci, an RCA A & R executive, who just happened to be on holiday there, invited them to Rome for a recording test. 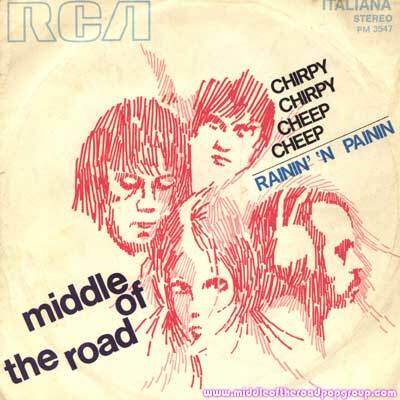 The band caused such excitement with their vocal sound that producers in Rome were tripping over themselves to use them to record film soundtracks, back existing Italian singers and record other original material, in Italian, as Middle of the Road. 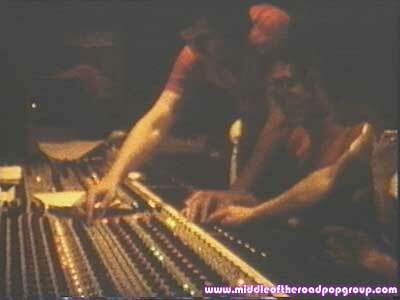 It is possible that their less than exorbitant recording session fees had something to do with this as well. One of the first of these was a recording with an unknown Italian singer called Jordan. 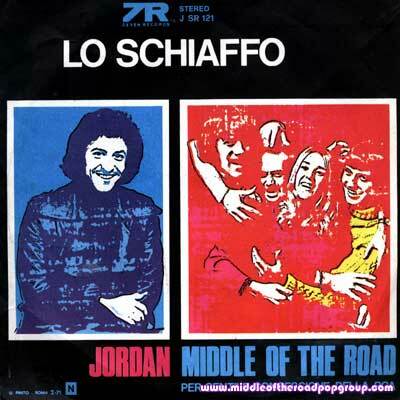 The song was an entry to the San Remo Song Festival in 1971 and the group had to perform it with Jordan live on TV, broadcast from the Casino theatre. The main part of the song began with everybody screaming “Aaaagh” at which point the four Scots would jump forward on stage almost knocking poor old Jordan into the wings. He had to recover quickly since the next line was his alone. The performance was noted for its amusement but the song didn’t win. The competition was pretty hot with artistes like José Feliciano and a host of top Italian groups and singers taking part. 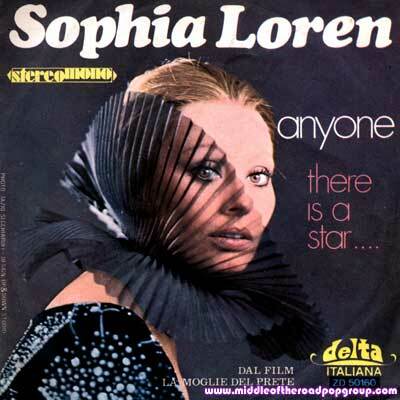 Another of those recording artistes backed vocally by Middle of the Road was none other than screen icon Sophia Loren and a fairly successful single entitled “Anyone” backed by “There is a Star” was released as a spin off for the film “The Priest’s Wife” (1971). 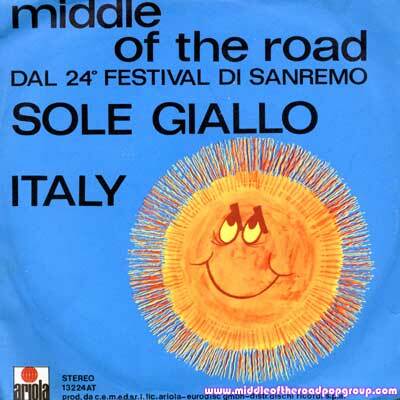 The publicity from this unexpected collaboration hit the world entertainment headlines, (except the UK) and Middle of the Road were established as a marketable product for RCA Italiana. Today these songs may be heard on recently released CDs in Europe and downloads on the web. It was at this time that they were teamed up with a bright, up and coming Italian producer, Giacomo Tosti. Then began the search for suitable material to launch RCA Italiana’s latest signing. Lally Stott, one of the many Brits working in Rome’s lively music recording scene, approached RCA with a song he had written and recorded himself. His record label, Philips, had already had a hit with his version of the song in Italy but they were reluctant to release it anywhere else. Giacomo heard it and immediately volunteered to produce a new version featuring his new Scottish band. When Ken, Ian and Eric heard it they fell about laughing. They reckoned that if anyone in the UK or any English speaking territory heard this, Middle of the Road would never be able to hold their heads up in public ever again. 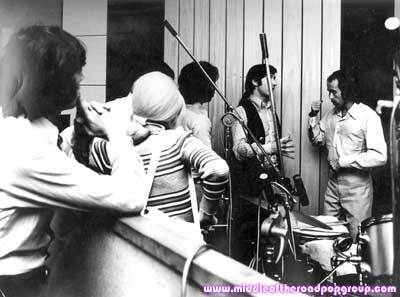 Sally, however, thought it was really catchy and finally the boys agreed to do it on condition that the recording session was supported with a supply of Bourbon to keep the spirits up. 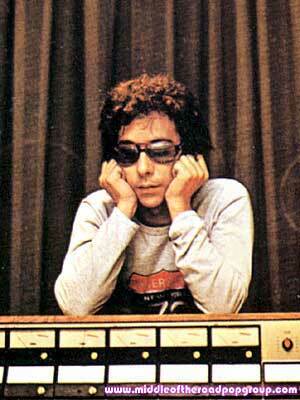 The session was not without its problems and the Bourbon came in handy but finally the song was ready. In the photo, Lally Stott (behind the mic stand) next to Ken, hammers out one of the problems and a very recognisable drum intro was born. By a strange coincidence RCA executives from all over the world were visiting the studios for a company convention and they were invited to the studio to hear the finished product. They all gave it the thumbs up and master copies were sent to all territories for release there. “Chirpy Chirpy Cheep Cheep” was set loose on the unsuspecting world. It was now obvious that more material was needed to follow up this first single and writers and arrangers Mario and Giosy Capuano joined the production team. The group shared many long and tiresome recording sessions in the enormous Studio One of the RCA complex in Rome. Often they would be leaving the studios to go home when the morning shift of engineers was coming in to begin their day. The combination of their production team, jointly known as Catoca, and the Scottish quartet was to prove to be a spectacular formula for success. “Chirpy” was a runaway success but the follow up single, “Tweedle Dee Tweedle Dum” needed some innovative promotion. What better than to put a new car on the road with “Middle of the Road”. As it happens, Fiat were launching their mini hatchback, the Fiat 127, and they were producing a short film for release in cinemas all over Europe. 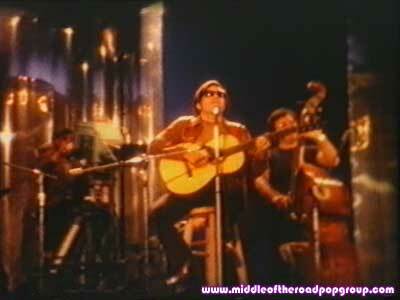 RCA struck a deal with them to feature “Tweedle Dee Tweedle Dum” and the band in the film. The foursome, who were still living in Rome, had the dubious pleasure of seeing themselves on the big screen, quite by accident, when they visited their local cinema one evening to see “Love Story”. They have never been able to work out what “Tweedle Dee” had to do with a car but in spite of this both car and song were highly successful. After “Chirpy” and “Tweedle Dee Tweedle Dum” had hit the charts, their third single broke the mould of nonsense songs and was a resounding hit. 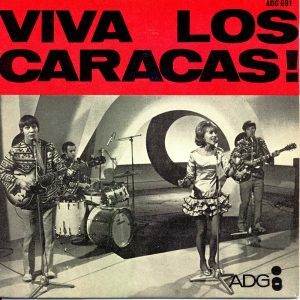 Written by a Spanish songwriter, Fernando Arbex, with lyrics co-written by Sally herself and produced by Giacomo Tosti just before Catoca was formed, “Soley Soley”, recorded in Madrid, became the summer hit for Europe that year. With astonishingly ‘good’ planning, RCA released the single in Britain… for Christmas! It wasn’t until March that “Soley” reached the number two spot in the UK charts when the weather was beginning to reflect the mood of the song. “Chirpy Chirpy Cheep Cheep”, “Tweedle Dee Tweedle Dum”, “Soley Soley”, “Sacramento” and “Samson and Delilah” were the group’s main hits in the UK, but world-wide they had numerous more. The record market, however, was suffering from the oil crisis and vinyl was in short supply putting pressure on the release of new material. The UK record label apparently turned its back on “the foursome from Italy”, the band’s perceived country of origin. 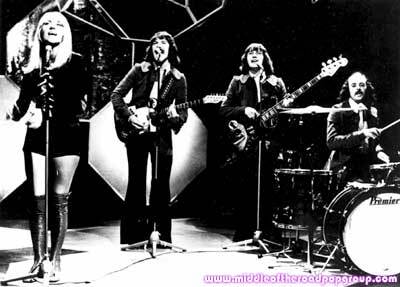 As a result, the UK public were given no further opportunity to follow the Scots group in spite of numerous appearances on Top of the Pops for BBC Television. Not so in the rest of the world. 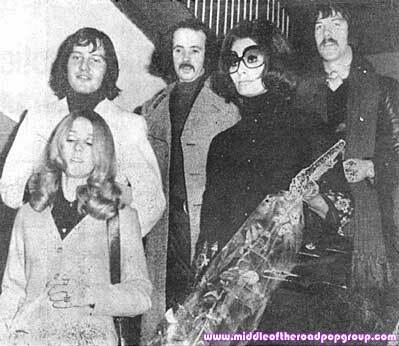 RCA Italiana were not going to allow any oil crisis to affect the popularity of their first and biggest international product and there followed a succession of releases that had the band travelling non stop round the world for the next two years. Brazil, Malaysia, Hong Kong, South Africa, Australia, New Zealand, Japan and Europe were treated to more “Middle of The Road” fun with singles like “Yellow Boomerang”, “Kailakee Kailako”, “Talk of all the USA” and many more. 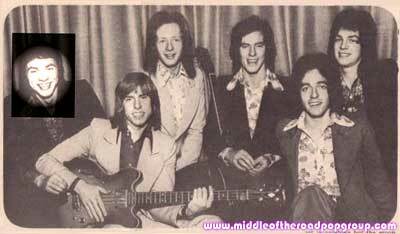 It was about this time they were joined by an escapee from another soon to be famous group, the Bay City Rollers. 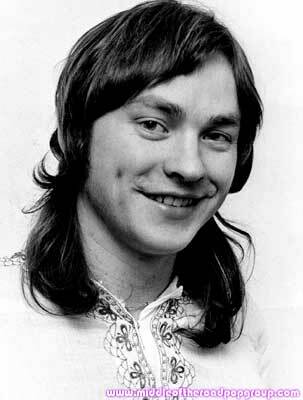 Neil Henderson, one of the original members of the Scottish ‘Teenie Bopper Supergroup’, decided he had to body swerve the ‘tartan terrors’ flamboyant outfits and settle in to the more ‘sophisticated’ image of the chirpy foursome from Glasgow and the final line up for Middle of the Road was established. 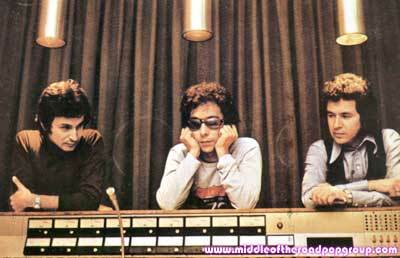 In the mid seventies, the successful collaboration between Catoca and Middle of the Road ended and each went their own way. In the best traditions of the music business it wasn’t until it was too late that they each realised the stupidity of this move. The magic formula had been discarded and a new era was about to begin.